After consulting the weather forecast and concluding that we had no way of knowing which hills were likely to escape the threatened thundery showers, we decided to head to Glen Etive for a couple of days backpacking. Therefore at 11:30 this morning we set off walking from near the end of the Glen Etive road. It was warm and sunny as we followed the estate road over the River Etive to reach Coileitir, where we picked up a boggy path that traversed the hillside in a south westerly direction for just under a kilometre. We boulder hopped across the reasonable sized river to reach a better path on its far side. We followed the reasonable path, ignoring the fork to Ben Starav, to continue southwards above the deep rocky gorge complete with impressive waterfalls. Soon after 1 we stopped at a convenient rock for lunch of wraps with spicy cheddar and salami. After lunch, we continued upwards up the steepening slopes complete with snow patches to reach the bealach. There were excellent views from the bealach; Ben Cruachan looked very impressive to the south, and we could pick out most of the Glen Coe mountains to the north. From the bealach, we followed a faint traversing path south east across boulder fields to reach a second, lower, bealach. Here it was sheltered from the wind, so we stopped for a break on some nice warm rocks. After sufficient rest we began our ascent of the north ridge of Beinn nan Aighenan. There were good views to the east of an impressive storm over Loch Tulla, which we hoped would pass to the south of us, and as we ascended it became clear that this would be the case. Higher up the ridge was covered in soft snow, which was quite deep in places and hence made for slow going. We reached the summit of Beinn nan Aighenan (Munro, Marilyn) at around 4pm. 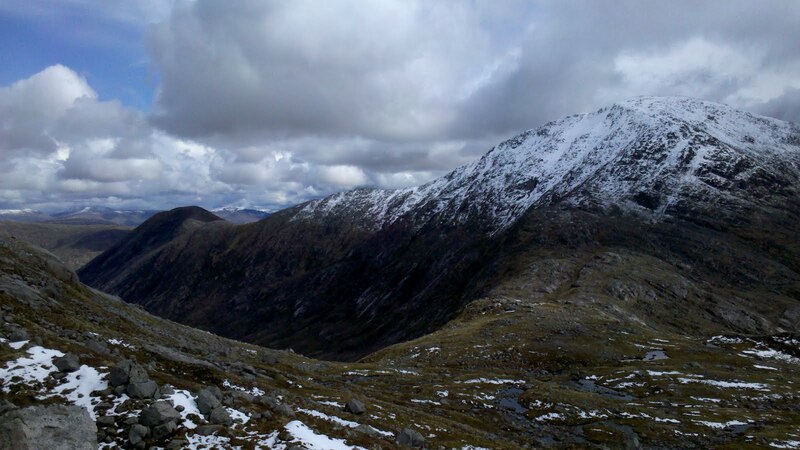 There were fantastic views from the summit across to the sunny, snow capped mountains of Argyll and the Glen Coe area. After admiring the views we retraced our steps northwards. By now it was clear that although the earlier storm had missed us, there were more dark clouds heading our way. The rain started shortly before we reached the bealach and we decided to camp around here for the night. Therefore we ascended briefly north away from the rocky bealach to find a nice flat grassy spot to camp for the night at just after 5pm. I was feeling quite tired so I had an early evening nap whilst Colin went to bag some random tops on the far side off the coire. On his return we had dinner of couscous, pepper, chorizo and cheese followed by chocolate mouse and hot chocolate. After dinner we sampled the fine New Zealand whisky that I had brought with me, which was nice but it seemed a little strange to be drinking non Scottish whisky in the Highlands! Post date changed to actual date of walk, and updated to include route map and photos.